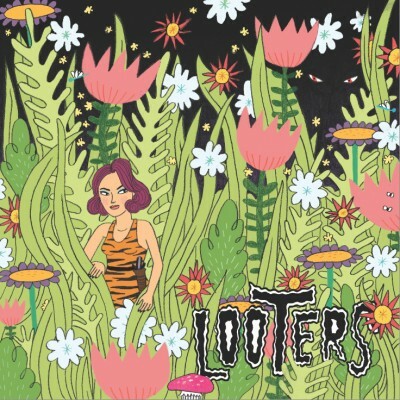 I’ve got my hot little hands on some new vinyl; the self-titled 45 from Brooklyn New York’s Looters. The band is a four piece consisting of Eliot Pride on guitar/vocals, Shane E. Kerton on drums/backing vocals, Gerard Smith on bass/backing vocals, and Dante Tuxedo on guitar. As mentioned, the band is outta Brooklyn NYC. The 45 showcases two tracks of Looters chops, with Fall Alone on the A-side and Looters on the flip. The cuts on the record are very heavy rock influenced as much by punk as by 60s garage and 70s heavy metal. The 70s can be distinctly heard in both the bass lines and the guitar solos. Perhaps oddly, the vocals, at least in the way words are drawn out and certain line breaks, I find reminiscent of Danzig. Not the style/tone mind you, just a certain approach. Combined, it adds up to a pretty decent sound. It’s fresh and new. Not in a new car smell sort of way, but in a full on restoration way. New paint on old parts if you will. If you’re interested, you can listed to seven full tracks on their Bandcamp site.